Goodness Gracious (TM) K# 9 Cologne Ticks hate it. 2oz and 4oz We love it. Repel ticks the all-natural way. Our K#9 Cologne is a proprietary blend of all-natural 100% human-grade, canine-friendly essential oils and sweet almond oil. It is citronella free! Goodness Gracious (TM) Ticks hate it. We love it. 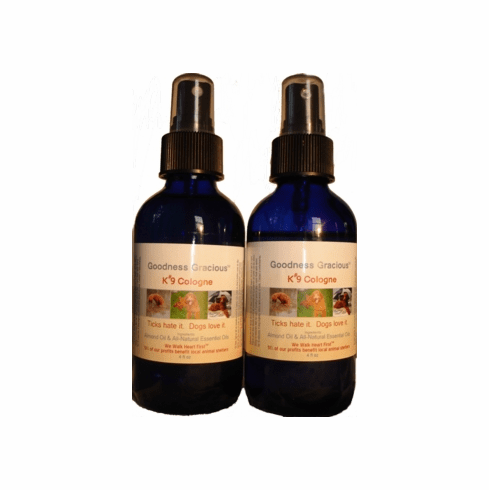 Repel ticks the all-natural way. Our K#9 Cologne is a proprietary blend of all-natural 100% human-grade, canine-friendly essential oils and sweet almond oil. It is citronella free! Sweet almond oil, the primary ingredient in our K#9 Cologne, is an exceptional emollient suitable for all skin types. Simply put a bit of the K#9 Cologne onto a bandanna or cloth and gently rub that cloth over your dog's coat to disperse the scent. For best, longest-lasting results tie the bandanna comfortably around your dog's neck and then go play! It's that simple. Each bottle contains 2 or 4 fluid ounces.